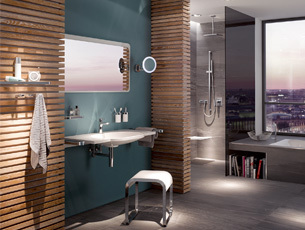 The sanitary System 800 is defined by a clear, reduced and nonetheless emotional design. The modular structure of System 800 allows bathroom design that can be precisely orientated to the individual needs of the user. The sanitary accessories and accessibility products were developed according to universal design criteria, so that they can be used easily, conveniently and above all flexibly. Well thought-through product details increase functionality. 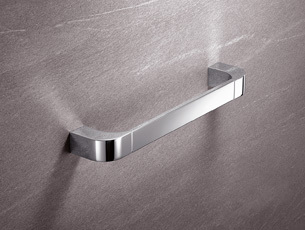 Thanks to the diverse options offered by System 800, the sanitary system can be used universally in the sanitary area. It is not only suitable for use in the private bathroom, but also for fitting out hotels, commercial buildings and institutional care facilities. The products have been developed together with Phoenix Design Stuttgart / Tokyo. The designers Andreas Haug and Tom Schönherr explain: "Our design concept for System 800 is based on the idea of universal design. 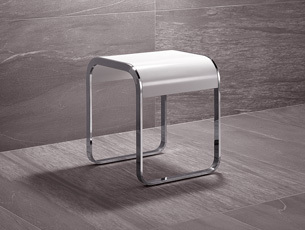 This means, we design comfortable, convenient, durable and aesthetic products for people in different living spaces. The clarity of the design should relate to the architecture and enthuse the people that use it. We are convinced that System 800 maintains a perfect balance between form, function and emotion and in this respect will outlast short-lived trends."